Last night it was the biggest night on the music industry calendar – the Grammys. So naturally, as with any red carpet event, it is time to look at the fashion! Last night it was the Grammys awards, which is one of my favourite red carpet events because celebs dress bolder. The dress code doesn’t seem to be as serious and formal as the Oscars for example and celebs tend to have more fun – and there were certainly some interesting choices! Last night was all about the 2016 Grammy Awards but the show is so long and with so many categories that I personally find the red carpet far more exciting. You can usually depend on the Grammys for some divisive fashion choices but I generally liked everything this year – especially this gorgeous look from Taylor Swift. People have been bashing her new bob but I think she looks fantastic. There were some crazy outfits from absolute nobodies, so they are not included. I have a ton of best dressed and just a few worst dressed which weren’t totally horrible, just a bit naff. The standard is high this year. What do you make of my choices? You can always rely on the music industry for an interesting red carpet. So far this year, I’ve just covered movie events and they’ve been pretty boring in comparison. At the Grammys this year, celebs went big – which means the difference between best and worst dressed is radical! It makes writing pieces like this much more fun. The Grammys were on the same night as the BAFTA, which was a total snooze fest fashion-wise compared to this. Be prepared for some crazy outfits to come! There are tons of cool backstage and audience photos that I just had to share with you from last night’s Grammys ceremony at the Staples Centre in LA. Ellen DeGeneres couldn’t resist having a gawp at Katy’s assets, even with her partner Portia De Rossi on her arm. Elton John seemed to have the same issue. We reckon John Mayer was very happy with her wardrobe choice. 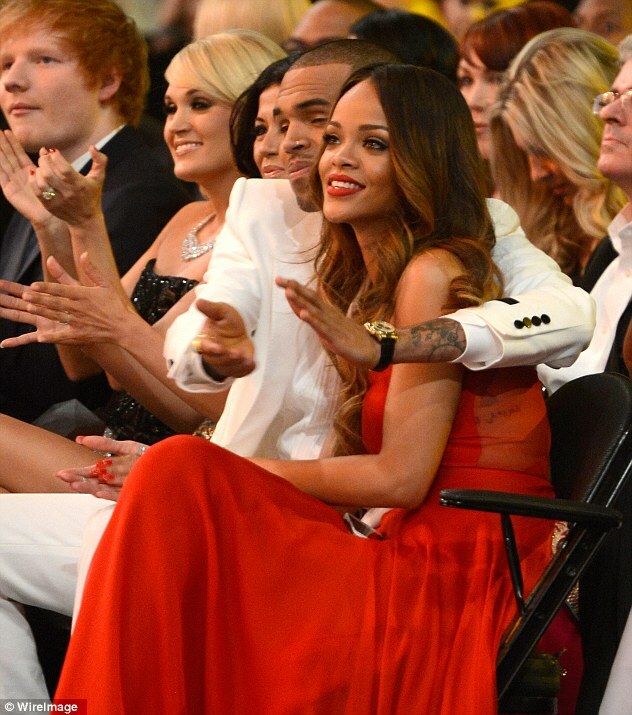 Chris and Ri happily displayed their rekindled relationship for all to see in the first row of the audience. The pair seemed blissfully unaware of the whispers of people still shocked at their romance. 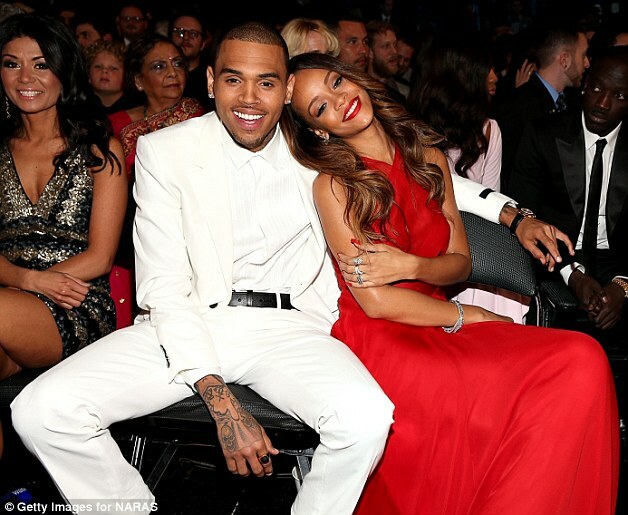 Chris’ assault on Rihanna occurred on their way to the 2009 Grammys, so they have come full circle. Rihanna also sparked rumours that she was engaged after wearing a simple diamond band on her ring finger during her performance of Stay. Who knows?! 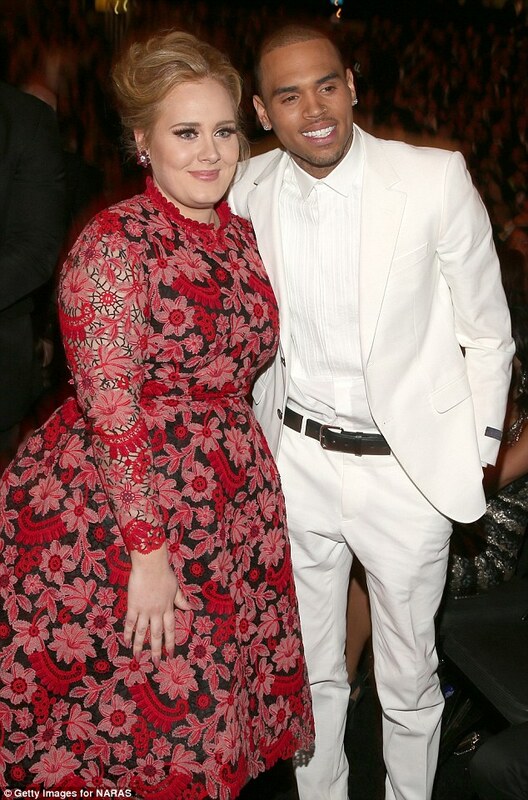 I was also shocked to see Chris pose with Adele! Weird pairing huh?! This picture is hilarious! 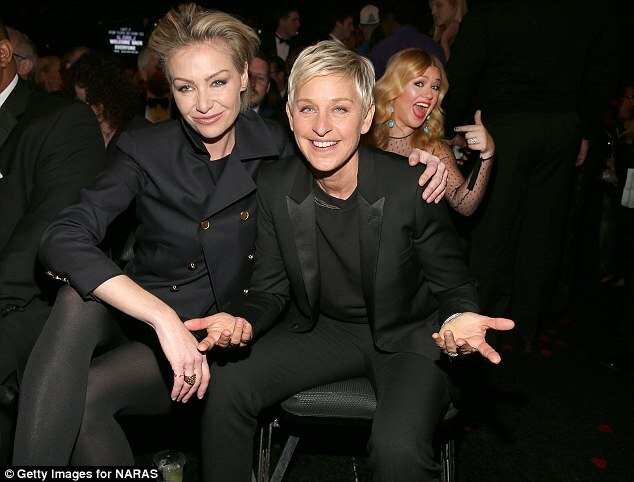 Kelly becomes the star of Ellen and Portia’s picture by photo bombing! Carey shunned the red carpet but was inside the auditorium to support husband Marcus Mumford. This is her giving him a squeeze when Mumford and Sons wins the best album category for Babel. I cannot believe this news. Singer and actress Whitney Houston was found dead in her hotel room, aged only 48. She was found at the Beverly Hilton Hotel where she was due to attend a pre-Grammys party Saturday evening. Police received an emergency call at 15.43 local time (23.43 GMT). Paramedics were already on the scene because of the party and their attempts to resuscitate her failed. She was pronounced dead at 15:55. The cause of death is still being determined but a police officer told the BBC that there were “no obvious signs of criminal intent”. However gossip site TMZ reports she had been partying heavily in Hollywood on Thursday and Friday. I really hope it wasn’t due to substance abuse because I thought Whitney was clean after her drug problems years ago. I’ll be keeping a close eye on this story to find out the cause of death. I still can’t quite believe she is dead because she is such a big star and she isn’t old at all. She hasn’t done anything notable in recent years but I look at her fondly due to The Bodyguard, I Will Always Love You and I Have Nothing. I will be incredibly missed. RIP Whitney.